The irrigation system consists of a (main) intake structure or (main) pumping station, a conveyance system, a distribution system, a field application system, and a drainage system (see Fig. 69). The (main) intake structure, or (main) pumping station, directs water from the source of supply, such as a reservoir or a river, into the irrigation system. The conveyance system assures the transport of water from the main intake structure or main pumping station up to the field ditches. The distribution system assures the transport of water through field ditches to the irrigated fields. The field application system assures the transport of water within the fields. The drainage system removes the excess water (caused by rainfall and/or irrigation) from the fields. The intake structure is built at the entry to the irrigation system (see Fig. 70). Its purpose is to direct water from the original source of supply (lake, river, reservoir etc.) into the irrigation system. In some cases, the irrigation water source lies below the level of the irrigated fields. 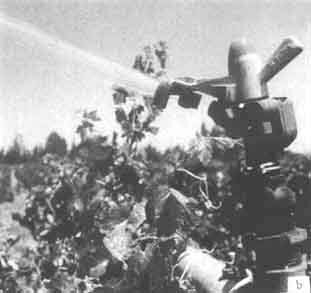 Then a pump must be used to supply water to the irrigation system (see Fig. 71). There are several types of pumps, but the most commonly used in irrigation is the centrifugal pump. The centrifugal pump (see Fig. 72a) consists of a case in which an element, called an impeller, rotates driven by a motor (see Fig. 72b). Water enters the case at the center, through the suction pipe. The water is immediately caught by the rapidly rotating impeller and expelled through the discharge pipe. The centrifugal pump will only operate when the case is completely filled with water. The conveyance and distribution systems consist of canals transporting the water through the whole irrigation system. Canal structures are required for the control and measurement of the water flow. An open canal, channel, or ditch, is an open waterway whose purpose is to carry water from one place to another. Channels and canals refer to main waterways supplying water to one or more farms. Field ditches have smaller dimensions and convey water from the farm entrance to the irrigated fields. According to the shape of their cross-section, canals are called rectangular (a), triangular (b), trapezoidal (c), circular (d), parabolic (e), and irregular or natural (f) (see Fig. 73). The most commonly used canal cross-section in irrigation and drainage, is the trapezoidal cross-section. For the purposes of this publication, only this type of canal will be considered. The typical cross-section of a trapezoidal canal is shown in Figure 74. The freeboard of the canal is the height of the bank above the highest water level anticipated. It is required to guard against overtopping by waves or unexpected rises in the water level. The side slope of the canal is expressed as ratio, namely the vertical distance or height to the horizontal distance or width. For example, if the side slope of the canal has a ratio of 1:2 (one to two), this means that the horizontal distance (w) is two times the vertical distance (h) (see Fig. 75). The bottom slope of the canal does not appear on the drawing of the cross-section but on the longitudinal section (see Fig. 76). It is commonly expressed in percent or per mil. Earthen canals are simply dug in the ground and the bank is made up from the removed earth, as illustrated in Figure 77a. The disadvantages of earthen canals are the risk of the side slopes collapsing and the water loss due to seepage. They also require continuous maintenance (Fig. 77b) in order to control weed growth and to repair damage done by livestock and rodents. Earthen canals can be lined with impermeable materials to prevent excessive seepage and growth of weeds (Fig. 78). Lining canals is also an effective way to control canal bottom and bank erosion. The materials mostly used for canal lining are concrete (in precast slabs or cast in place), brick or rock masonry and asphaltic concrete (a mixture of sand, gravel and asphalt). The construction cost is much higher than for earthen canals. 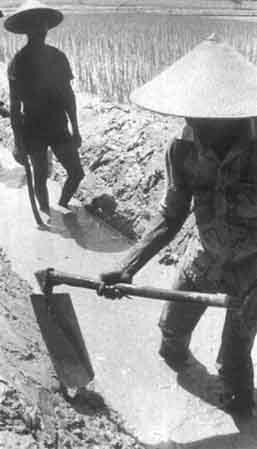 Maintenance is reduced for lined canals, but skilled labour is required. 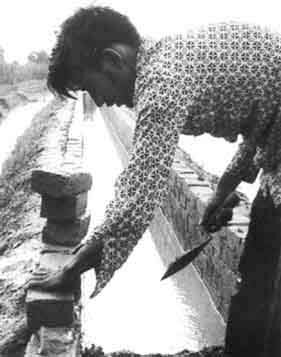 The flow of irrigation water in the canals must always be under control. For this purpose, canal structures are required. They help regulate the flow and deliver the correct amount of water to the different branches of the system and onward to the irrigated fields. There are four main types of structures: erosion control structures, distribution control structures, crossing structures and water measurement structures. Canal bottom slope and water velocity are closely related, as the following example will show. A cardboard sheet is lifted on one side 2 cm from the ground (see Fig. 79a). A small ball is placed at the edge of the lifted side of the sheet. It starts rolling downward, following the slope direction. The sheet edge is now lifted 5 cm from the ground (see Fig. 79b), creating a steeper slope. The same ball placed on the top edge of the sheet rolls downward, but this time much faster. The steeper the slope, the higher the velocity of the ball. Water poured on the top edge of the sheet reacts exactly the same as the ball. It flows downward and the steeper the slope, the higher the velocity of the flow. Water flowing in steep canals can reach very high velocities. 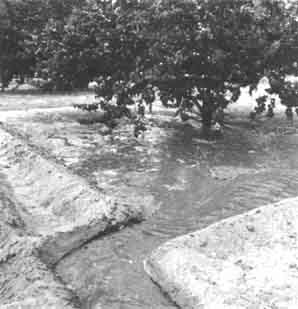 Soil particles along the bottom and banks of an earthen canal are then lifted, carried away by the water flow, and deposited downstream where they may block the canal and silt up structures. The canal is said to be under erosion; the banks might eventually collapse. Drop structures or chutes are required to reduce the bottom slope of canals lying on steeply sloping land in order to avoid high velocity of the flow and risk of erosion. These structures permit the canal to be constructed as a series of relatively flat sections, each at a different elevation (see Fig. 80). Drop structures take the water abruptly from a higher section of the canal to a lower one. In a chute, the water does not drop freely but is carried through a steep, lined canal section. Chutes are used where there are big differences in the elevation of the canal. Distribution control structures are required for easy and accurate water distribution within the irrigation system and on the farm. Division boxes are used to divide or direct the flow of water between two or more canals or ditches. Water enters the box through an opening on one side and flows out through openings on the other sides. These openings are equipped with gates (see Fig. 81). Turnouts are constructed in the bank of a canal. They divert part of the water from the canal to a smaller one. Turnouts can be concrete structures (Fig. 82a), or pipe structures (Fig. 82b). 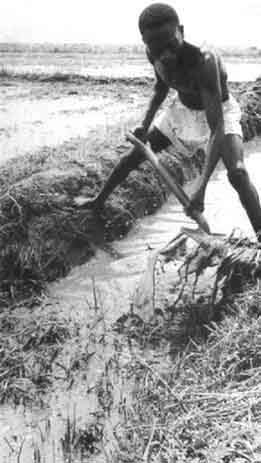 To divert water from the field ditch to the field, it is often necessary to raise the water level in the ditch. Checks are structures placed across the ditch to block it temporarily and to raise the upstream water level. Checks can be permanent structures (Fig. 83a) or portable (Fig. 83b). It is often necessary to carry irrigation water across roads, hillsides and natural depressions. Crossing structures, such as flumes, culverts and inverted siphons, are then required. Flumes are used to carry irrigation water across gullies, ravines or other natural depressions. They are open canals made of wood (bamboo), metal or concrete which often need to be supported by pillars (Fig. 84). Culverts are used to carry the water across roads. The structure consists of masonry or concrete headwalls at the inlet and outlet connected by a buried pipeline (Fig. 85). 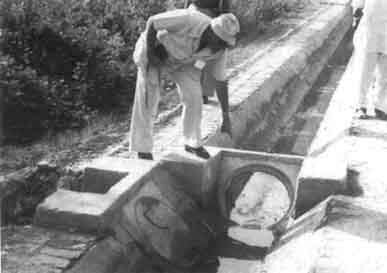 When water has to be carried across a road which is at the same level as or below the canal bottom, an inverted siphon is used instead of a culvert. The structure consists of an inlet and outlet connected by a pipeline (Fig. 86). Inverted siphons are also used to carry water across wide depressions. The principal objective of measuring irrigation water is to permit efficient distribution and application. By measuring the flow of water, a farmer knows how much water is applied during each irrigation. In irrigation schemes where water costs are charged to the farmer, water measurement provides a basis for estimating water charges. The most commonly used water measuring structures are weirs and flumes. In these structures, the water depth is read on a scale which is part of the structure. Using this reading, the flow-rate is then computed from standard formulas or obtained from standard tables prepared specially for the structure. In its simplest form, a weir consists of a wall of timber, metal or concrete with an opening with fixed dimensions cut in its edge (see Fig. 87). The opening, called a notch, may be rectangular, trapezoidal or triangular. The Parshall flume consists of a metal or concrete channel structure with three main sections: (1) a converging section at the upstream end, leading to (2) a constricted or throat section and (3) a diverging section at the downstream end (Fig. 88). Depending on the flow condition (free flow or submerged flow), the water depth readings are taken on one scale only (the upstream one) or on both scales simultaneously. The cut-throat flume is similar to the Parshall flume, but has no throat section, only converging and diverging sections (see Fig. 89). Unlike the Parshall flume, the cut-throat flume has a flat bottom. Because it is easier to construct and install, the cut-throat flume is often preferred to the Parshall flume. There are many methods of applying water to the field. The simplest one consists of bringing water from the source of supply, such as a well, to each plant with a bucket or a water-can (see Fig. 90). This is a very time-consuming method and it involves quite heavy work. However, it can be used successfully to irrigate small plots of land, such as vegetable gardens, that are in the neighbourhood of a water source. More sophisticated methods of water application are used in larger irrigation systems. There are three basic methods: surface irrigation, sprinkler irrigation and drip irrigation. Surface irrigation is the application of water to the fields at ground level. Either the entire field is flooded or the water is directed into furrows or borders. Furrows are narrow ditches dug on the field between the rows of crops. The water runs along them as it moves down the slope of the field. The water flows from the field ditch into the furrows by opening up the bank or dyke of the ditch (see Fig. 91a) or by means of syphons or spiles. Siphons are small curved pipes that deliver water over the ditch bank (see Fig. 91b). Spiles are small pipes buried in the ditch bank (see Fig. 91c). In border irrigation, the field to be irrigated is divided into strips (also called borders or borderstrips) by parallel dykes or border ridges (see Fig. 92). The water is released from the field ditch onto the border through gate structures called outlets (see Fig. 92). The water can also be released by means of siphons or spiles. The sheet of flowing water moves down the slope of the border, guided by the border ridges. Basins are horizontal, flat plots of land, surrounded by small dykes or bunds. The banks prevent the water from flowing to the surrounding fields. 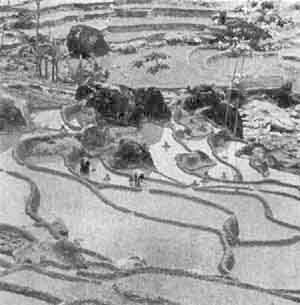 Basin irrigation is commonly used for rice grown on flat lands or in terraces on hillsides (see Fig. 93a). Trees can also be grown in basins, where one tree usually is located in the centre of a small basin (see Fig. 93b). With sprinkler irrigation, artificial rainfall is created. The water is led to the field through a pipe system in which the water is under pressure. 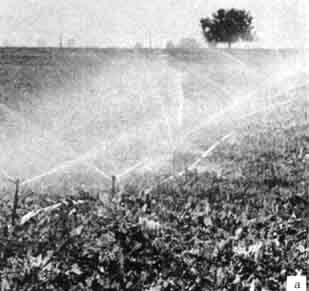 The spraying is accomplished by using several rotating sprinkler heads or spray nozzles (see Fig. 94a) or a single gun type sprinkler (see Fig. 94b). In drip irrigation, also called trickle irrigation, the water is led to the field through a pipe system. 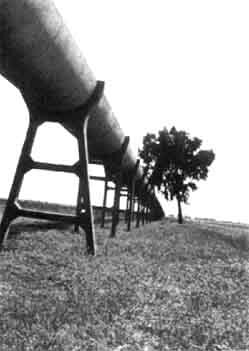 On the field, next to the row of plants or trees, a tube is installed. At regular intervals, near the plants or trees, a hole is made in the tube and equipped with an emitter. The water is supplied slowly, drop by drop, to the plants through these emitters (Fig. 95). A drainage system is necessary to remove excess water from the irrigated land. This excess water may be e.g. waste water from irrigation or surface runoff from rainfall. It may also include leakage or seepage water from the distribution system. Excess surface water is removed through shallow open drains (see Surface drainage, Chapter 6.2.1). Excess groundwater is removed through deep open drains or underground pipes (see Subsurface drainage, Chapter 6.2.2).